"I remember singing it over and over again as a kid because it's such an infectious melody. My parents would play it all the time." "I wanted to learn this because it sounded easy. That was foolish - you don't start out with Hendrix! I learned the hard way. When I bought my first guitar I got a Chuck Berry songbook, and I learned the rudiments of Roll Over Beethoven." "I'll never get sick of hearing that, or Kashmir by Led Zeppelin. We played a festival with ZZ Top once, and it was excruciating. I've never seen them - I've tried, but we're always on tour or playing at the same time at the same festival. One day!" "I think something like that or Electric Worry bridges the gap between the blues that we do and the rock, because they have both elements in them." "Oh boy, choosing my favourite song is like picking a favourite child! I'm pretty proud of The Regulator. It was a kind of different thing for us and a bit risky doing almost a ballad with the fingerpicking thing. It was one of those songs that wrote itself very quickly and easily, and after all these years I still like it." The song of mine that I wish I could erase is… There isn't one! "It's as good as disowning a kid. Even if I don't really care for one, we still made it. It's all part of the learning process. To make great songs you have to make not-so-great songs. There's some early stuff [we don't play], but we've changed over 25 years and it feels awkward. Saying that, we just started playing Passive Restraints from '92." "I usually play this to see how the fifth and sixth strings feel, then I might play some Mississippi John Hurt to see how the fingerpicking feels. Or a terrible rendition of some Magic Sam, because it's really hard to play on any guitar, but if it's a good guitar it makes it a lot easier." "It's pretty hard. It's a fast song that requires a pick and almost approaches solo speed, and I can't do a guitar solo worth a damn. I've tried, and it's not good. I'm much more adept at fingerpicking. I like guitar, but I also like taking it off, sometimes I feel a bit anchored by it." "I am of the opinion that this is best solo ever recorded, and it's because of 'the note'. I think any guitar player knows what I'm talking about when I say 'the note'. When he goes into his solo he plays one note for eight, maybe 16, bars, and it's just the way he bends it. It's so emotive. It just goes to show you don't need to do all the blazing fast arpeggios." 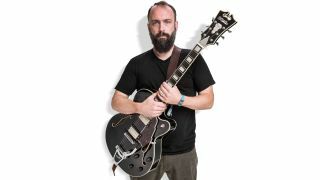 Clutch tour the UK in December. Visit the band's website for more information.